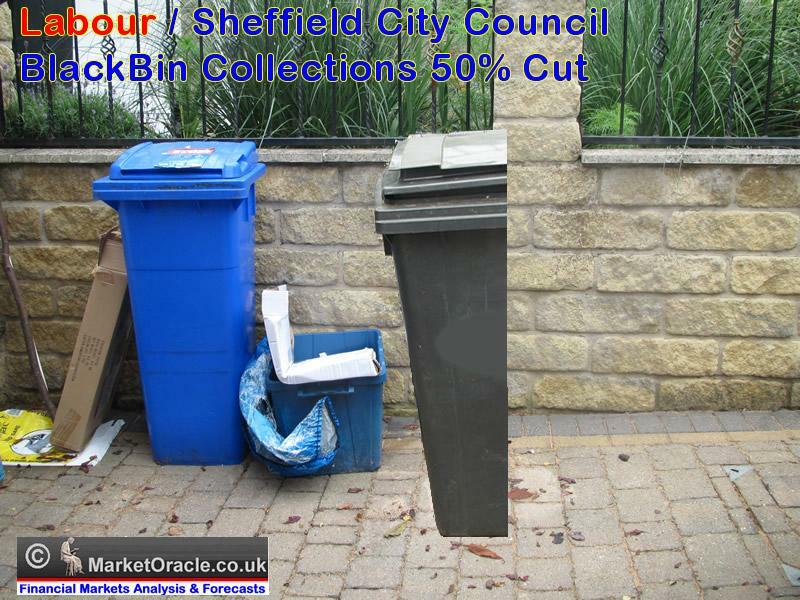 Sheffield residents are increasingly outraged at what they perceive to be the unilateral action by the Labour regime, Sheffield City Council to cut black bin collections by 50%, all without any prior discussion with residents at the ballot box, most of whom only find out of the changes AFTER they find that their black bins have gone uncollected. Leaflets informing residents of the changes were supposed to be have been sent out by the waste management company but have only been received by few. Other measures have also been adopted for those with larger bins in use to be replaced with smaller 240 litre 'standard bins', so some households will see effective bin collections cut by as much as much as 66%. The claim by Labour / Sheffield City Council is that this will reduce waste by 10% and cut costs by saving £1.6 million in year 1 and £2.4 million over several years, though at an estimated cost of £1 million to implement, (whose pockets will that money be lining!) so for a net saving of just £600k in the first year which is set against the annual budget of £1.47 billion! 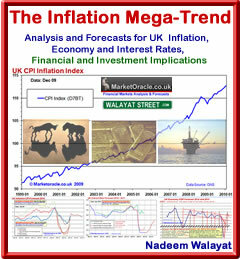 Though what these calculations fail to incorporate the impact of high public sector / monopoly services Inflation, which insures that several years from now that we may find that NO monies have been saved. Additionally the argument of cutting waste by 10% is nonsensical because households will still generate the same amount of waste, it's just that less of it will find its way into black bin's and more elsewhere such as fly tipped. Both the Liberal Democrats and Labour party are to blame for the fiasco that is Sheffield's waste collections and processing, such as the handing over of Sheffield's incinerator to Veolia after tax payers were forced to spend £25 million on upgrades! The degree of incompetence can be witnessed in the Veolia's company accounts, where the company reported an annual 18.4% jump in profits for 2011 to £119.5 million on revenues of £1,251 million. Therefore even before the latest change a large chunk of your council tax was going towards Veolia's profits, and even more now that black bin collections will be cut by at least 50%, despite apparently Sheffield City Council having another 15 years to run on a 25 year contract for weekly bin collections. This apparent long 25 year contract with Veolia needs to be investigated further into why in the first instance were Sheffield residents signed to such a lengthy contract and secondly why 10 years into the contract are bin collection services now being cut by 50%. At the very least such an investigation will illustrate how incompetent Sheffield City Council are in managing public funds, at worst could reveal alleged serious irregularities in the arrangement of contracts with a whole host of suppliers resulting in a huge waste of council tax payers monies. The change in bin collections will encourage fly tipping by many residents left with over flowing black bins, many of which could go uncollected due to weight / bin lid closure policies. Therefore escalating cost of clearing fly tipping will effectively end up costing the city council many times more than the pittance that it will actually be saving on cutting bin collections. Where does your council tax money go ? According to an analysis of our own personal annual extortionate £2,141 council tax bill, waste disposal and recycling accounts for approx £75, and in total we are in receipt of services amounting to about £503 per year (including contribution towards emergency services). So where does all of the rest of the money go ? The answer is that the City council over the decades has become a bloated institution that has accumulated many layers of management, monitors, consultants, and a whole host of other money wasting bureaucracy, all to the detriment of front line services, many of which have been contracted out to the private sector under just as bad basis as the contract with Veolia. Therefore instead of cutting black bin collections by 50% and encouraging more costly to clean up fly tipping, it would be far better to get rid of some of the bureaucracy that pollutes Sheffield city centre, such as those stationed at Howden House that shuffle mountains of paper between office floors all day. The bottom line is that Sheffield City Council is again demonstrating itself as being unfit for purpose, and It is high time for Sheffield's council tax payers to protest against the latest outrage, to stand up and demand that Sheffield City Council actually delivers the front-line services that residents are forced to pay for rather than witness literally hundreds of millions wasted each year on mostly worthless bureaucracy and a whole host of irrelevant money wasting activities such as fact finding trips (holidays) abroad for councilors, chauffeur driven cars and other perks for councilors and thousands of managers. Therefore instead of cutting bin services by 50% the council should cut management by 50% that will result in savings of several orders of magnitude greater than the net £600k expected. It is time for a new deal between the Council and tax payers, that new deal should involve the dissolution of most of the services it offers, to make way for a whole of host of small businesses to contract directly with residents, all without the monopoly of abuse of powers that the likes of Veolia can operate under and therefore at far lower cost to the consumer as waste management and other service providers would compete against one another for consumer interest. 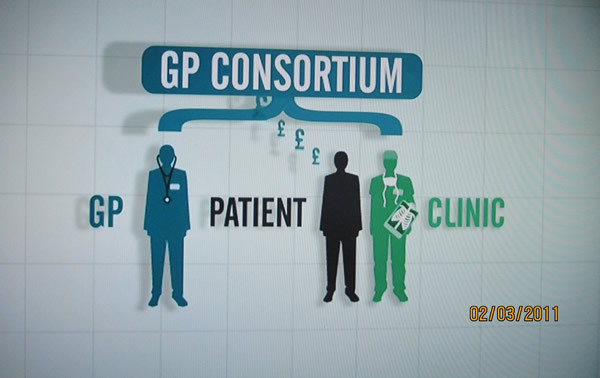 This competition between service providers should not just be limited to the council services but all public services such as the NHS, where implementation of Coalition government reforms is proving to result in the exact opposite anti-competitive consortia's, as virtually all of the Sheffield NHS 92 GP Practices have signed up with one of of 4 geographically located GP Consortia's. The NHS GP reforms being implemented are pushing towards the worst of both worlds, i.e. no market competition and unprecedented GP control over NHS funds that in significant part will be funneled into the back pockets of NHS GP's. The bottom line is that that tax payers are increasingly being forced to pay MORE for LESS services, because there is no concept of value for money in the public sector due to lack of competition for consumers, and even when contracting out to the private sector do so in a manner that is to detriment of services as councils tend to replace public monopolies with private monopolies. Public monopolies are operate as inefficient unproductive entities, whilst private monopolies make huge profits at tax payers expense such as evidenced by Veolia's profit jump of 18.4% in 1 year!